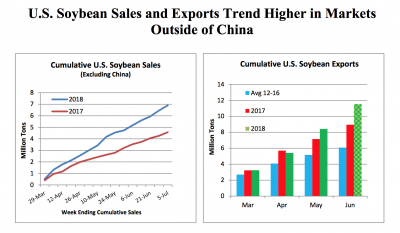 As the impacts of the ongoing U.S.-China trade dispute continue to unfold, a report last week from the U.S. Department of Agriculture provided some insight into how the Chinese tariffs are affecting soybean markets. Today’s update looks at news reports that discuss trade issues and the USDA report in greater detail. Today the Senate overwhelmingly passed a measure that would help make certain Congress plays a role in the implementation of tariffs that relate to our national security. I went on @BloombergTV to discuss this important legislation and current trade issues. Thursday’s article added, “Trump already has imposed levies on Chinese solar panels, steel, aluminum and many machine and industrial parts. They are aimed at pressuring China to make significant changes that would sharply reduce its trade surplus with the U.S. Others in the administration want to press China to halt policies that compel American firms to turn over technologies in order to obtain access to the large Chinese market. China will import less, American farmers will lose business and Brazil will be a beneficiary. Mr. Meyer explained, “As the top soyabean importer, accounting for more than 60 per cent of global trade, China’s move [to increase duties on U.S. soybeans] has rattled markets. Soyabean futures have slumped to levels at which many US farmers will lose money without federal assistance. The US Department of Agriculture, in monthly supply and demand estimates published on Thursday, cut its forecast for China’s soyabean imports from 103m to 95m tonnes in the coming marketing year, reduced its outlook for US soyabean exports by nearly 11 per cent from 62.3m to 55.5m tonnes and raised its estimate of Brazilian exports from 73m to 75m tonnes, a record high. 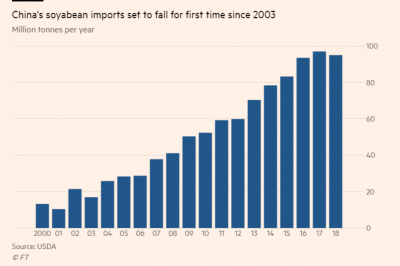 “US cuts forecast for soyabean exports to China,” by Gregory Meyer. The Financial Times (July 13, 2018). The Financial Times article pointed out that, “Sonny Perdue, US secretary of agriculture, has said USDA economists were calculating the effects of trade disruptions as he weighs federal assistance to farmers hurt by lower prices. Note that in a Radio Update from USDA on Friday, farmdoc’s Carl Zulauf explained that it will be very difficult for USDA to determine how much financial damage to farmers is due to the tariffs. Sat down with members of @ILSoybean today who are just as concerned as I am about President Trump’s trade war. We also discussed ongoing negotiations with the Farm Bill. Since the start of President Trump’s trade war, the value of soybeans has dropped 20%. This is hurting Illinois farmers and the rural economy. I asked @ILSoybean members to stay strong and we’ll weather this storm together. In a related item, Brianne Pfannenstiel reported on Wednesday at The Des Moines Register Online that, “A day after President Donald Trump threatened to levy an additional $200 billion in tariffs on Chinese goods, Vice President Mike Pence was in Cedar Rapids promising Iowans that farmers will come out ahead in the end. 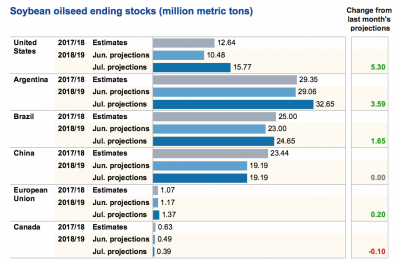 World Agricultural Outlook Board Chair Seth Meyer discussed the new soybean price forecast in greater detail on Friday in a brief update from USDA Radio News. “World Agricultural Supply and Demand Estimates at a Glance,” USDA- Economic Research Service. Additionally on the issue of trade variables and U.S. soybean exports, USDA’s Foreign Agricultural Service indicated in an update Thursday that, “U.S. soybean exports reached record territory in May and are expected to reach a record in June based on export inspections. This strong pace of trade reflects the strong pace of net sales to markets outside of China. “Since late March, cumulative sales to these markets have approached 7 million tons, roughly 50 percent ahead of last year’s pace. In contrast, cumulative net sales to China over the same period have turned negative in recent weeks as recent cancelations have exceeded sales since the end of March. “Oilseeds: World Markets and Trade.” USDA- Foreign Agricultural Service (July 2018).